I realize this has been a day of reflection for most of the world. As we look back on 2011 and remember things that were accomplished and memories that were made. Good and bad habits that may have just begun or happily ended. I look back on 2011 as an uneventful year. Not uneventful in the way most people would think. Uneventful because my family didn’t have a lot of big change. In the 14 years that Duane and I have been married, we usually have some kind of a show-stopping, life-changing thing that happens. New job. New house. New car. Not are all good. We’ve been though job losses. My mom passing away. And losing an unborn baby. Good or bad, we’ve pretty much run the gamut. This year however, was uneventful because of the lack of change that happened in our marriage. But 2011 held some huge changes for me, personally. I had a lot of “I am Woman, Hear Me Roar” moments. Here they are in no particular order. 1. I went to LA by myself! Twice! This may not be super huge for some people, but for someone with a huge fear of flying and the never-ending thought of my plane plunging to the ground resulting in my demise, this was a really big step for me. Both trips resulted in me feeling a little more confident about who I am and where I want my life to go. 2. I started a blog. Again, not huge for some people, but for a non-writer, non-creative like myself, my blog has been a huge turning point for me. I realized that I am comfortable stepping out of my happy homemaker box and finding a creative outlet that doesn’t seem very mom-ish. Thank you to everyone who reads and subscribes. You make me feel like I have something important to say that isn’t aimed at the stylings of a preschooler. 3. I went back to work. Another huge step in the life of a stay at home mom. I took the plunge to find something more than scrubbing toilets and wiping noses. Granted, I still do both of those and more, but I feel like I have found something for myself that I enjoy, my husband likes to brag about, and my kids take pride in. To me, a huge win. 4. I grew back my green-thumb. My garden was happily restarted, a little late in the season, however, but still flourished to my happiness. I also managed to can and freeze most of my crops. Yes, little Suzy Homemaker still exists and thrives in her suburban home. So, how do you measure a year in the life? 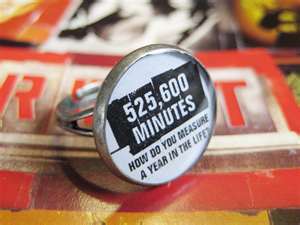 525, 600 minutes doesn’t seem like much time, but in this last year of my life, I have accomplished much. And much happiness has been had during this season. I hope and pray that this next year will welcome such change as 2011. My baby is getting married!